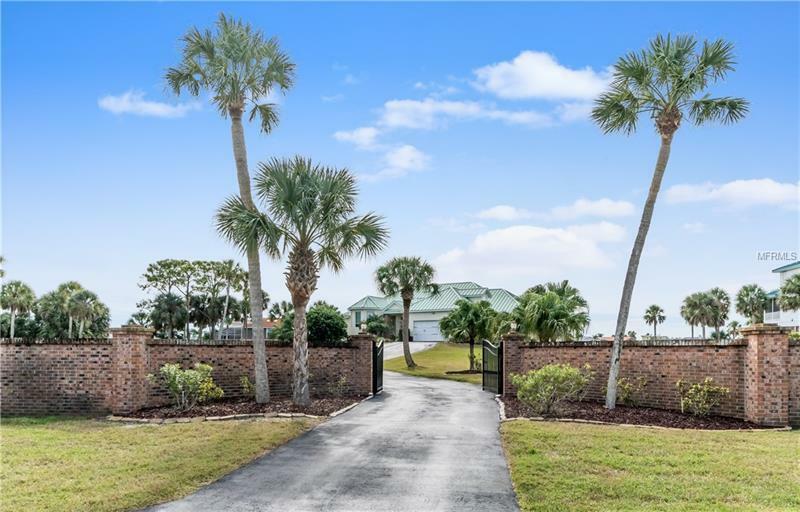 TAKE ADVANTAGE OF YOUR CHANCE TO OWN THIS BEAUTIFUL WATERFRONT ESTATE ON 1.2 ACRES FOR UNDER $1 MILLION. From the moment you drive through the gates you'll be awed by this special property. Situated on a deep water canal leading to the Gulf of Mexico this boaterâs dream house is perfect for serious boaters sailors & land loverâs alike. With views of the water & nature preserve this quiet oasis is a unique opportunity for the boater who wants it all. 160 ft of water frontage new docks (2015) span 100 feet & includes 2 fixed docks 1 fitted with tide slides a floating dock & a 12000 lb. boat lift & private boat ramp. There is room in the 2 garages for all your toys. The land that this beautiful custom built home sits on was built up and is engineered & designed for hurricane protection (concrete walls steel roof & piling to bedrock) which not only benefits the owner with very low flood insurance but also creates space under the house for a 3 car/boat garage and a large storage/work space. All this and the 3774 ft. house is beautiful and spacious with its open floor plan gourmet kitchen with upgraded appliances split floor plan 4 bedrooms large office/den 2 full and 2 half baths. The large lanai outdoor kitchen and pool is perfect for entertaining. For beach loverâs Robert K. Reeves Park is just down the street. This home is close to all that the Tampa Bay area has to offer; shopping restaurants golf courses sporting venues and theaters. Tampa Airport is just a 48-minute drive.